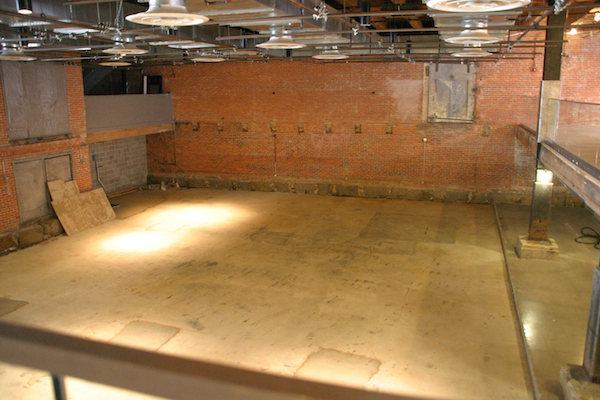 Tomorrow, we’ll take this raw space and transform it into a rehearsal studio for seven dancers, a scientist, and a poet. Thank you to the staff at Midway Studios and the residents living above, who have already dropped by to say hello. Thank you to Weber Dance, Boston Dance Alliance, and Hallkeen Real Estate. And thanks to Boston Street Lab’s Maggie Husak, an urban planner, dancer, and force that helped bring this project to life. It will take us a few days to get up to full speed, but please stop by any time. We’re excited to begin the experiment. Today is the first day that the dancers and the storyteller, Jon Turk, will meet. During this rehearsal the dancers will be showing all five completed sections of the dance to Jon. The choreographer, Jody Weber and Jon will be discussing the overall arc of the piece and putting together a plan for what spoken word will accompany the first and second sections. We will also be using our time to adjust to the lovely new space and get settled for our next three weeks of work.